A much-forwarded screenshot of a traffic map last weekend had a typical Bangalore touch to it: a trip of 5.7 km from Mahadeva­pura to KR Puram station in East Bangalore would take 44 minutes by car. Less, if you walked. This KR Puram traffic nightmare, by the way, has become a staple of Bangalore-themed social media memes. It is en route to one of India’s first Information Tech­nology parks or export zones. Just as iconic is the bottleneck at Central Silk Board across the city. And there are several more that commuters encounter on their daily pilgrimage—their very own ‘chaar-jam yatra’, as another joke puts it. Yet, on that same weekend, some 50 feet below the city’s central hub of Majestic, people were queuing up at the Bangalore Metro platforms to board trains that were already packed as they arrived. But it’s a world that’s starkly different from that above. For starters, it’s squeaky clean. Of course, inside the coaches, there’s just about room to stand—understandable because Majestic is where you change lines. The train takes 23 minutes to get to Peenya, an industrial hub 11 km away, and about 20 minutes to reach Mysore Road at the opposite end. Tackling both stretches by road on a weekday is a feat in itself. Traffic speed along the IT corridor that arcs south-east at the Central Silk Board is estimated at 4.5 km per hour. The first phase of the Bangalore Metro, has been operational for the past four months. It’s almost reaching capacity now, which is no surprise. Bangalore has never been known for wide roads or long distances (radially, suburbs like Whitefield to the east or Kengeri to the west are just over 20 km). But its commuters still spend hours on the road. There are over 6 million vehicles in the city of 10 million people. Its flyovers, grade separators and outer ring road are all now choked. Traffic speed along the IT corridor that arcs from the east to the south-east at Central Silk Board is estimated at 4.5 km per hour. 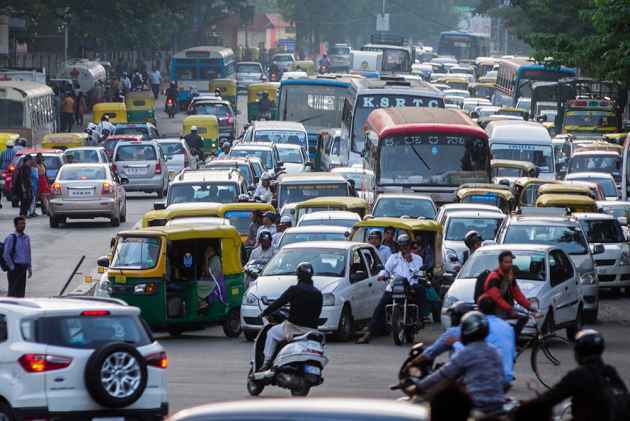 “60 per cent of Bangalore’s roads are narrow. So buses can’t operate on all the roads,” says traffic expert M.N. Sreehari.The Metro will be the backbone. “There has been a perceptible increase in ridership,” says Pradeep Singh Kharola, M.D. of Bangalore Metro Rail Corporation Ltd (BMRCL). There could be several reasons for that, he says, including the fact that it is the festival season and that it has been raining incessantly. So far, the Metro has clocked 4 lakh passengers a day on two occasions in these past four months, the latest coming just last week. To be sure, the metro rail has had its problems with rain too, with water seepage in stations. But Kharola points out that it didn’t affect operations. Rather, there have been req­uests to extend the services of the Metro—the first pick-up is currently at 5 am and the last train leaves at 11 pm. Still, the system currently traverses only 42 km, and doesn’t go as far as the junctions mentioned earlier. Those are being tackled in Phase 2, the Rs 26,405-crore undertaking that will hopefully make it easier for Bangaloreans to get around. Mobility is a big part of that. Bangalore was the first city in India to have low-floor, air conditioned buses, which connected its IT hubs. Its bus network ferries 4.91 million passengers every day. But just about everyone will tell you how the city’s public transport system is non-existent. More suburban trains are needed to connect densely populated areas. “850 people move into the city every day. The Metro’s carrying capacity, even at full tilt, will simply never be enough to keep up with population growth, let alone the exi­sting population,” says Mahesh. Of course, the Metro doesn’t have to carry everybody, he poi­nts out. “The Metro is a multi-year thing. Doubling the bus fleet can be completed next year,” he says. Bang for the buck, Mahesh reckons, will come from nimbler, lower cost solutions. Two years ago, he worked with the state government to draw up a decongestion strategy that took into account infrastructure, sustainability, buses and walkability among others. 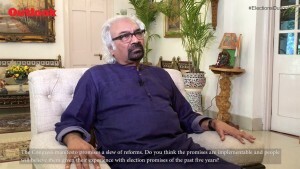 But implementation has failed to keep pace, something he attributes to unchanging government mechanisms. “If we don’t do that, we keep coming back to these crises again and again. 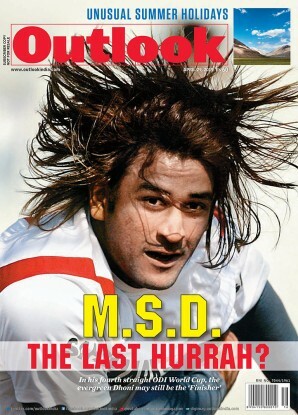 There’s nothing that I, or anybody in the city, can tell (about Bangalore) today that was not told 10 years ago. The only thing that’s missing is to act on them,” says Mahesh. The Metro will require an efficient feeder system to be effective. “The metro alone cannot do magic. We need a multimodal solution. Last mile connectivity is required at every station,” says Sreehari. The second phase of the project, Kharola says, has been planned better. “Out of the 72 km of Phase 2, minus the underground portion, everything should be up and running by 2019. That’s pretty fast. The underground takes one more year,” he says. “We have learnt from experiences. Phase 1 was the first time for everybody...for the workers, engineers, even for the contractors,” he says. At Central Silk Board, there are plans to int­egrate the Metro station and its lines with a network of road flyovers that would rem­ove almost all the intersections. Work on some Phase 2 lines is nearing completion. The Metro, Kharola asserts, is already making a difference. “Travel time is really coming down from hours to minutes. That’s the big change,” he says. He expects to open two of the extensions by the end of next year, coinciding with the effort to double the number of trains. Currently, each train runs three coaches, and BMRCL is looking at increasing that to six. “The real impact will come when we start carrying a million people. Right now the plan is, we complete Phase 2 and touch a million people by 2019,” says Kharola. 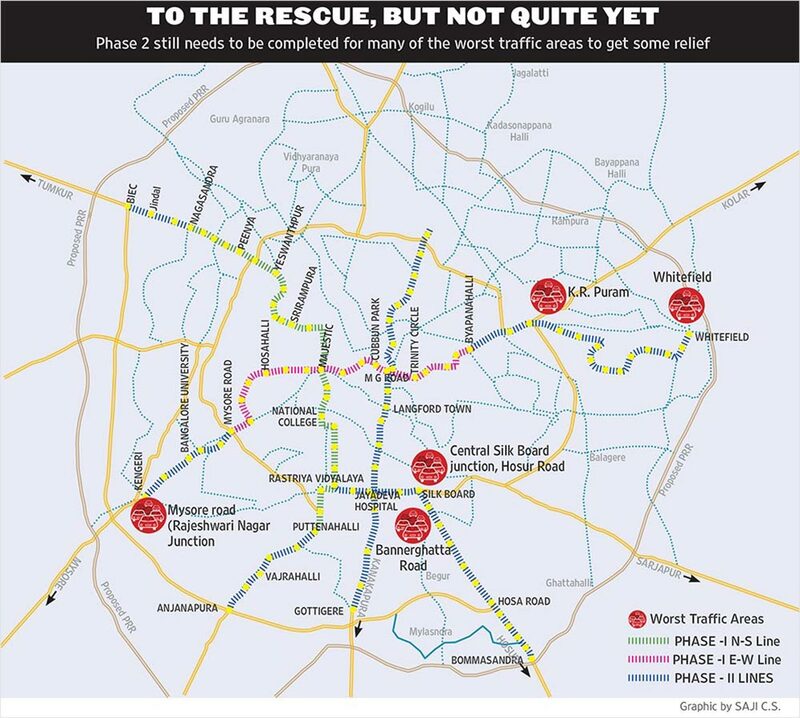 For Bangalore, that promises relief from some of its traffic problems. To be sure, the Metro can’t do it single-handedly. And there’s plenty else to be done if we’re talking about seamless travel.